As if it weren’t difficult enough to protect your property and identity, Fort Collins and Loveland police departments and city officials are reporting that the incidence of burglary and resulting identity theft appears to be on the rise. Now, more than ever, it’s important to know how to make your house look lived in, if you’re going out of town. Simply put, you don’t want to advertise that no one’s home and make your house an easy target for predators and other threats, like curious neighborhood teenagers looking for a thrill. If you have pets it’s a no-brainer to hire a professional pet sitting company. Personalized, in-home pet care is much better than kennels and has the double benefit of someone coming or going – or staying over – at your home. There’s no doubt that the first step to insuring your house looks lived-in is to hire a professional pet sitting company. For example, our pet sitting service includes: looking for signs of suspicious activity, police notification if something seems amiss, fetching your mail and newspapers, bringing in door hangers or fliers, taking trash cans to the curb and returning them, changing window coverings to simulate activity and picking up branches or debris near main entryways that may have fallen during a storm. Likewise, we take all signage off our vehicles before entering your neighborhood, so as not to advertise you’re absence. Our pet sitting amenities are hands down designed with safety and comfort in mind. But beyond the security a professional pet sitting team can provide, what can you do to increase the security of your house and make your house looked lived in? I mean, what good is the benefit of using a professional pet sitting company if you’re broadcasting you’re not home? We’ve compiled a handy list that will help you make your house look lived in and deter burglars during your absence. 1. Walk around your house and assess its weaknesses as though you were a burglar. Areas of your house that are dark or poorly lit? Areas of your yard that are accessible without being seen by neighbors? Overgrown shrubs or trees blocking street visibility from entryways? A garage door that doesn’t lock? Remember, burglars will pick the “low hanging fruit” that is, homes that are easy to approach and get into. If you have any of the above, get the areas fixed. Buying screens, glass and motion sensor lights and having them installed is much cheaper than a devastating home break-in. Likewise, trimming those shrubs and trees will not only help make your house look lived in, it will protect you and people authorized to access your house, such as your pet sitter. 2. Put radios, lights and televisions on timers. It’s important to put radios and televisions on separate timers and to make sure the timers you use have a “random” setting. Likewise, have several lights in different parts of the house on “random” set timers. That way, someone casing your house will not be able to determine any set patterns of light activity. 3. Tell a trusted neighbor about your absence and participate in neighborhood watch programs that post signs. Having an extra set of eyes on your property is a proven method of criminal deterrence. Fostering good relationships with your neighbors is not only personally satisfying, it can pay off in spades. See about starting a neighborhood watch. 4. Can’t afford a professional security company? Post phony security sticker decals on your windows and doors. Criminals are lazy. The more roadblocks you can put up in their path, the less likely they’ll choose your house as a target. Posting decals is a cheap and effective deterrent. Find phony security stickers now. Sometimes all it takes to make your house look lived in is a “Beware of Dog” sign. 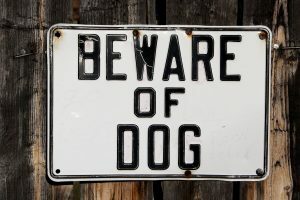 Burglars can deal with a lot of criminal deterrents, but some will not face the unknown danger of dogs protecting a house. If you have a choice of having your pet sitter open and close curtains that look onto a couch and bookcase, or one that looks onto your large screen T.V. and surround-sound system, choose your couch. Likewise, don’t place obviously valuable things in your windows for display. Burglars don’t always reach second-story windows by James Bond Moves. Likewise, they don’t necessarily have leather tool packs in their breast pockets. They look in your shed and grab your ladder and tools. Don’t let a burglar exploit your carelessness. Keep all areas that contain ladders and tools locked. Do people have access to your house in your absence or have copies of your keys? You have a cleaning service that will be accessing your house. You have scheduled maintenance happening during your absence. You have a landscaper that will be on the premises. You have neighbors or family members with keys. Hide your valuables in unobvious places. Likewise, when purchasing your big ticket items (like flat screens and computers) do not leave the empty boxes at the curb for pick-up. Cut them up in small, manageable pieces and place them in non-transparent garbage bags before taking them to your recycling facility or disposing of them. This is very simple to do and can help find your belongings in the case of a burglary. The police and your insurance company will need a detailed list of your belongings in order to replace or recover stolen items. Photographs are even better, as it takes less time. Be sure to store your list and/or photos in a safe place, such as your safety deposit box. Taking these 12 Steps to make your house look lived in will go a long way in deterring burglars from targeting your home. 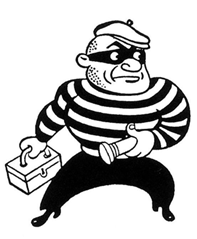 Remember, burglars are lazy – they pick the easiest and safest targets that present to least amount of challenges.